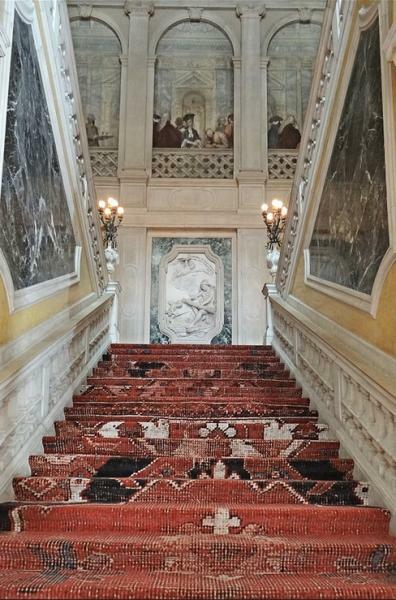 Now the seat of the Francois Pinault Foundation, along with the nearby Dogana di Mare, the Palazzo Grassi is one of Venice's chief showcases of contemporary art, featuring Pinault's private collection as well as special exhibitions throughout the year. Designed by Giorgio Massari and built between 1745 and 1772, the Grassi homestead was the last grand palace built on the Grand Canal. Neoclassical in style, it has a formal white marble facade, but varies notably from earlier models: the ground floor wasn't dedicated to merchandise, and rooms are built around a courtyard. Frescoes along the grand stair are by the school of Tiepolo. The Grassi family didn't hold onto it for long. Sold in 1840, and passing through several hands after that, the palazzo was purchased by Gianni Agnelli for the Fiat Group in 1983 and was restored as an exhibition centre and outdoor theatre, the Teatrino, seating 600. In 2006, the palace was sold to French businessman and contemporary art collector François Pinault.